ABUJA — THE power sector received a boost, yesterday, following the signing of Power Purchase Agreements, PPAs, between Nigerian Electricity Bulk Trading Plc, NBET, and 14 solar energy firms to the tune of $2.5 billion. Hon. Minister of Power, Works & Housing, Mr Babatunde Fashola (2nd right), shortly after the signing ceremony of Solar Power purchase agreement between National Bulk Electricity Trader(NBET) and Fourteen Solar Power Developer at the Transmission Company of Nigeria, (TCN), Maitama,FCT, Abuja on Thursday 21, July 2016. The signing, which was supervised by the Minister of Power, Works and Housing, Mr Babatunde Fashola, is described as the largest investment in the sector ever. Fashola, in his speech, disclosed that the Federal Government would develop 20 per cent of total energy consumed in Nigeria from renewable sources by 2030. He said: “It is the determination of the Federal Government of Nigeria to ensure that the country’s power sector is no longer dependent on the vulnerability of one energy source. “It is important to mention that this signing does not mean Nigerians will see steady power supply immediately because this is the first phase and it is going to take some time to see the projects constructed and start rendering services. “The sun is free but the process to get the power from it to the people is not free because it has to involve technology. Solar power is evolving and emerging to get it to the consumers. The signing of the PPAs paved way for financial closures and eventual commencement of full commercial operations by the companies involved in the development of the 14 solar projects. 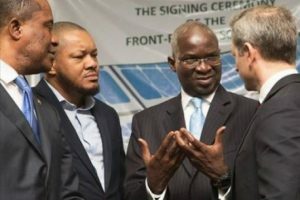 The companies licensed by the Nigerian Electricity Regulatory Commission, NERC, are Pan Africa Solar, which is developing a 75mw solar plant in Katsina State; Nigerian Solar Capital Partners (100mw) in Bauchi State; Afrinergia Power Limited (50mw) in Nasarawa State; and Motir Dusable Limited (100MW) in Nasarawa State. Others are Nova Solar 5 Farm Limited (100mw) in Katsina State; Kvk Power Limited (100mw) in Sokoto State; Middle Band Solar One Limited (100mw) in Kogi State; LR Aaron Power Limited (100mw) in the FCT; and Nova Scotia Power Development Limited (80mw) in Jigawa State. Also on the list are CT Cosmos (70mw) in Plateau State; En Africa (50mw) in Kaduna State; Oriental Renewable Solutions (50mw) in Jigawa State; Quaint Abiba Power Limited (50mw) in Kaduan State; and Anjeed Innova Group (100mw) also in Kaduna State. In his earlier remarks, Acting Managing Director/CEO, NBET, Waziri Bintube, said gas shortages experienced by gas-fired power plants, due to pipeline vandalism, had made it imperative for the country to seek alternatives to gas. Bintube said the Power Purchase Agreements, PPAs, would achieve the goal the company had been chasing after over three years of commitment and doggedness between it and the 14 solar energy firms. “When these projects, that will commence in the last quarter of 2016, are completed in the next 12 to 18 months, a combined 1000 megawatts of electricity will be generated and added to the national grid for public consumption at the cost of 11.5 cents per kilowatt hour,” he stated. Speaking on behalf of the investors, Managing Director/CEO, Pan African Solar, Marcus Heale, promised that the companies would adhere to the agreement of 11.5 cent (N23.00) tariff per kilowatt hour.